Two weeks ago, I was asked about the right time to say "no" to a child. Most recent opinions about this seem to suggest that delaying saying "no" has many benefits, most importantly providing a positive and nurturing environment for the child. This is certainly something to think about. I, however, do think that saying "no" will not have any detrimental effects on the child's upbringing even at an early age. In fact it can be useful. We have to keep in mind that is it CRITICAL to give children an alternatives as often as possible, and use "no" when it is regarding something potentially dangerous/serious. For example, if your child is playing with your phone, we can simply redirect him by saying "This is mummy's not yours, but here's your toy, while you hand your child something that belongs to him. If the child was trying to touch the fire/heater, saying "no" is appropriate. Explain why whenever possible. When we are talking about parenting, we very often have to also talk about reality and practicality and not just ideals. Does that mean we are not providing our very best? Not at all! Your young child would have heard "no" from you or others even if it not directed at him/her. Furthermore, in interactions with other adults, your child may have been told "no" directly. Thinking about cognition and the development of linguistic awareness, it makes more sense that we associate from an early age a relationship between the word "no" and its meaning. Children thrive within a structure and within a predictable environment, and some limitations are necessary. Allowing the child to hear the word "no", will also teach the child about assertiveness. You would have taught your own child how to express his disdain or refusal. I can probably hear some "oh no's" from you readers right now, but again, an expressive child will be more successful and independent than a non-expressive child. When children start saying "no" this is the ideal time to teach them about choices and consequences. Do you remember our earlier post about discipline (here)? Remember that video of the boy during the tantrum?. These types of tantrums can be seen in very young children; even younger than the expected "terrible twos" stage. When structure is in place and some rules are implemented, the tantrums can be dealt with more efficiently. So what is our summary? Saying "no" can be beneficial. It builds structure and differentiates between dangerous and non dangerous behavior. Saying "no" also provides children with predictability, which makes them feel safe. Try to give alternatives whenever possible instead of "no" for very young children. For older children: Keep giving alternatives and show your child how to correct their own mistakes. 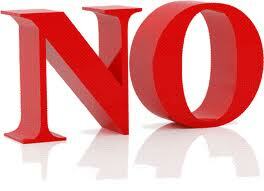 Saying "no" teaches children about assertiveness and allows them to express negative emotions. Give children choices and teach them about consequences.